Massage: This method is favored by many professional aromatherapists. Specific essential oils are chosen to suit the condition and temperament of the person. They are the blended with a base oil. Such as Just The Essentials massage base, grapeseed, or sweet almond. The essential oil content should be between 1% and 3%. As a general rule, physical ailments like arthritis or muscle spasm demands a stronger concentration than conditions of an emotional nature. The following is just a guide line. Pay attention to the precautions of the essential oils when deciding what oils you want to put into your blend. Remember, be conservative when starting your blend – you can always add more essential oil to the blend. Massage ensures that the oils are effectively absorbed through the skin and into the bloodstream. 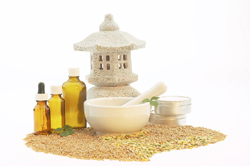 Skin oils and lotions: The essential oils are prepared in much the same fashion as they would be in massage. The emphasis here is on treating the skin itself. It is important not to pull or drag on the skin, especially in the delicate areas. A few drops of essential oil can be added to a favorite cream, lotion, or face mask. You can make your own face masks from fruits, oatmeal, honey, sea products &amp; milk then add your essential oils to the mixture. Hot and Cold Compresses: A hot compress can be made by filling a bowl with hot water, then ad 4-8 drops of essential oil. Dip a folded piece of cotton cloth into the bowl, squeeze out the excess water and place the cloth on the affected area until it has cooled. Hot Compresses are very useful when wanting relief from arthritis, backache &amp; earache. During the acute stage of injury, unless specific directions have been given, use a total of 6 – 8 drops of essential oil on the compress, whether that is hot, cold, wet or steamed. Hair Care: Use a few drops of essential oil in your hair shampoo or conditioner. Lavender added to your shampoo can help to repel lice and fleas. Bergamot and Tea Tree help to control dandruff and dry scalp. Hair growth: bay, clary sage, ylang ylang. Hair loss: cedarwood, rosemary, sage, ylang ylang. Dandruff: cedarwood, patchouli, sage, rosemary, tea tree, bergamot. Normal hair: Lavender, rosemary, eucalyptus lemon, geranium, carrot. Greasy hair: thyme, cypress, birch, basil, sage, clary sage, lemon. Dry hair: yarrow, lavender, rosemary, sandalwood. Bath: This is my personal favorite way to incorporate essential oils into my day. Bathing with essential oils provides an experience that is both cleansing for the skin and balancing for the emotions. Early morning wake up: 3 drops bergamot, 1 drop basil, 1 drop peppermint. Insomnia: 1 drop of each, lavender, marjoram, chamomile, valerian. PMS: 1 clary sage, 1 geranium, 3 lavender, 1 rose. Stress relief: 6 of neroli, 3 bergamot. Immune Boost: 4 tea tree, 1 frankincense, 2 lemon. Essential oils can be added directly to the bath water. They will not disperse when added so you may want to add them to an oil or soap base first. This helps to distribute the essential oils evenly for maximum absorption. Footbath: A foot bath can be a relaxing experience and a wonderful way to receive the benefits of the essential oils. A few drops of Lavender and Eucalyptus are helpful at combating athlete’s foot and fighting fungus. Peppermint: refreshing, great after a long day. Swollen feet: Lavender, chamomile, fennel. 1 drop each into a bowl of iced-water. Tired feet: 3 drops of rosemary and 2 tablespoons of baking soda will help soothe away tiredness. To help stop an ingrown toenail from becoming infected massage daily with the following: 8 drops tea tree 8 drops lavender into 10ml. of a carrier oil. Facial steam: Steaming your face with essential oils is a gentle and effective way to stimulate blood circulation, moisturize the skin, &amp; unclog the pores. Use the same method as used for inhalation. Irritated skin: chamomile, rose, peppermint, rose, tea tree, sandalwood benzoin, carrot seed. Sensitive skin: jasmine, orange, peppermint, rose, chamomile jasmine, neroli. Mature skin: frankincense, sandalwood, neroli, rose, palmarosa, myrrh patchouli, carrot seed. Oily skin: bergamot, frankincense, grapefruit, tea tree, lemon, ylang ylang, clary sage. Dry skin: geranium, jasmine, lavender, rose, patchouli, sandalwood, palamarosa. Normal skin: bergamot, geranium, lavender, neroli, chamomile, rose. Acne: chamomile, juniper, lavender, rosemary, tea tree, lemon. Perfume: Selecting a scent is personal experience. You can create a unique personal perfume for yourself. This will require you to experiment with several oils until you find a blend that works for you. There are many books with information on making perfume. I’ll give you a few helpful hints and information so you can try your hand at personal blending. Your perfume base can be made from alcohol for a cologne (5%total essential oils), jojoba or sweet almond oil for a perfume base (10% total essential oils), or spring water for use in an atomizer as a spritzer (1% total essential oils). Cologne: Pour the essential oils (3.5ml. )that you have chosen for your cologne into 70ml. of 100% proof vodka, stirring slowly but long enough to ensure complete dispersal of the oils. Let is stand for 48 hrs. then add 30ml spring water. Stir slowly, mixing thoroughly. Let the mixture stand for at least another 48 hrs. If you follow the procedures of the perfume trade, they leave the liquid sealed for 4-6 weeks. This allows the perfume to mature. Once your perfume has matured, pour it through a paper coffee filter and bottle. If it is to strong, you may further dilute it by adding more spring water and mixing well. Opium by St. Laurent: Orange, pimento berry, bay, carnation, rose, ylang ylang, cinnamon, jasmine, orris root, benzoin, patchouli, frankincense. Shalimar by Guerlain: Lemon, bergamot, mandarin, rosewood, patchouli, rose, jasmine, orris root, vetiver, vanilla, benzoin, balsam de peru. Chanel NO. 5: Bergamot, lemon, neroli, jasmine, rose, orris root, ylang ylang, vetiver, cedarwood, vanilla. Georgio: Orange, bergamot, pimento berry, carnation, cinnamon, patchouli, orris, rose, cedarwood, benzoin, and vanilla. Paco Raban: Laurel, bergamot, lavender, rosemary, pettigraine, clary sage, carnation, geranium, rosewood, cinnamon, pine, cedarwood. Aramis: Orange, bergamot, pimento berry, lemon carnation, cinnamon, rose, jasmine, ylang ylang, patchouli, sandalwood, vanilla, and benzoin. Due to the expense of certain oils you may substitute a pure essential oil with a 6% dilution from Just The Essentials. We carry in 6% dilution of: neroli , carnation absolute, german blue chamomile, morrocan chamomile, roman chamomile, jasmine absolute, rose damask absolute, rose maroc absolute, sandalwood, vanilla, and others – see essential oil listing. Atomizer: Is an effective, quick, way to deodorize and disinfect a room without harmful chemicals. It is a great way to cool the body and refresh the face. It is an extremely effective way to carry the benefits of essential oils with you, no matter where you go. Fill a dark spray bottle with distilled or spring water. For each ounce of water, add up to 6 drops of essential oil. Shake well before each use. Burners: Just The Essentials carries a large selection of beautiful burners for use with your essential oils. This is an excellent method that allows you to enhance your environment and gently release the oils into the atmosphere. A burner is an indispensable tool in the art of aromatherapy. By heating the oil, a diffuser effectively introduces the fragrance and beneficial properties of an essential oil to use a burner, fill the reservoir in your burner with water. Add 8 – 10 drops of the oil or oils of your choice. Light the tea light and place it below the burner. Light bulb rings: A light bulb ring sits on top of the light bulb. You add 4 -6 drops of essential oil into the cavity of the ring. When the lamp is turned on the heat of the light bulb causes the oils to vaporize, releasing the essential oils and their specific properties into the atmosphere.